You’re on TV. You’re being chased by the police. They’ll never stop you. You’ll fight to your last breath. A voice constatnly repeats in your head: more chaos more money. 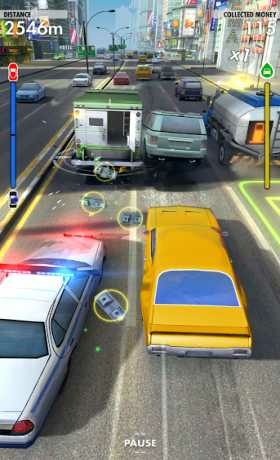 – Flee from the police, smash the MoneyTruck to steal the cash, draft your way to stardom and riches. Avoid collisions or the police will catch and your days of glory will be over. While doing all this don’t forget to refuel or game over. – Upgrade your cars and items to maximize rewards. Increase the performance of our car and booster power by picking-up items to get more cash to pay for the upgrades. 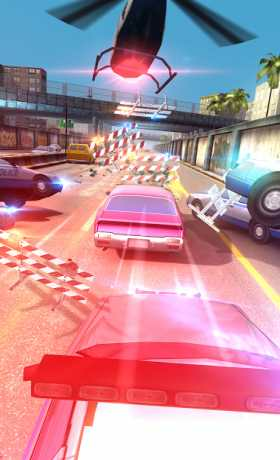 – Complete up to 200 missions to level up, receive rewards, unlock new cars, items, game modes and levels. – Participate in special runs to get extra rewards. 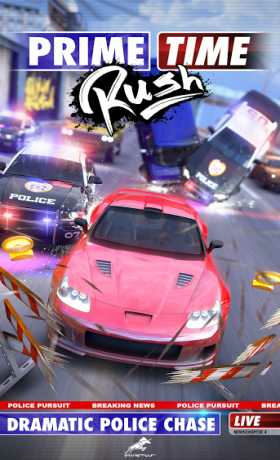 Knock out the limousine, smash the prisoner bus, slalom through the police blockades, flee through rush hour traffic at maximum speed! – Experiment with different kind of sport cars. Each car has special abilities offering different advantages on your race to glory and fame.